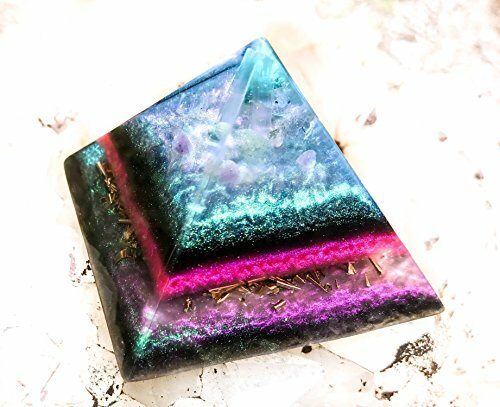 Experience the power of the Violet Flame with this orgonite crystal pyramid intended to transmute imbalanced energies through the balancing power of light! A selenite wand floats within a crystal grid of rainbow moonstone and amethyst over illuminating mica at this tip of this orgone generator pyramid to radiate white light throughout your space. Alternating layers of iron, shungite, petalite, selenite and epidote hold a layer of amethyst and malachite over brass shavings and my EMF Protection blend in the base. I used light reflecting micas to draw Reiki symbols during the final stage of pouring this powerful pyramid. please note Every Violet Flame Orgone creation is hand made and therefore one of a kind. The images above accurately portray the size, aesthetics and energy of the pyramid; however, you will receive a unique creation intended for you.